Popular hardscaping features include driveways, retaining walls, fire pits, patios, and things like that. Your landscaping is the trees, plants, and shrubs on your property. Hardscaping refers to property features that are made of harder materials, such as stone, brick, or concrete. Popular hardscaping features include driveways, retaining walls, fire pits, patios, and things like that. Along with being functional and versatile, adding hardscaping features to your landscape has some great benefits! Your landscape requires periodic trimming, watering, and other general maintenance tasks. Hardscapes, however, require very little regular maintenance. As long as you keep an eye out for chips or cracks and keep it clean, concrete, brick, and other hardscape materials can go for months without needing any special attention. Landscape design elevates the appearance of your property. Hardscape polishes it off. Your lush, colorful garden would look even better with a retaining wall to hold it in place. 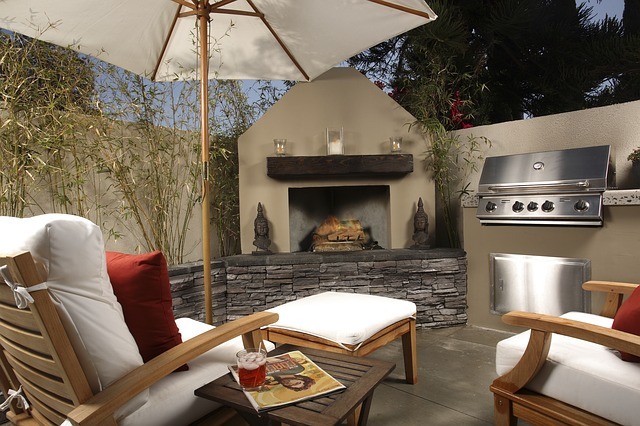 Your back patio is great, but adding a stone fire pit would turn up the fun. Even something as small as a row of stones defining the borders of your gardens makes your property look more put together! It’s summer here on the East Coast, and backyard barbecue season is in full swing. Where do homeowners set up the grill? On the patio. If your property has a patio, that’s hardscaping! One of the most fun features of backyard barbecues is the pool. Without a pool patio, that water would get dirty and gross really fast. Hardscape features make entertaining more enjoyable! Even if you’re not entertaining guests, a fire pit is great for a night of hanging out with the family! Last, but certainly not least, hardscape features can greatly increase your privacy. Adding a gazebo, pergola, trellis, or even just a covered patio can provide you and your family more privacy. As an additional bonus, these structures also provide shade! This entry was posted on Friday, August 17th, 2018	at 8:45 pm	and is filed under Concrete	. You can follow any responses to this entry through the RSS 2.0	feed. Both comments and pings are currently closed.